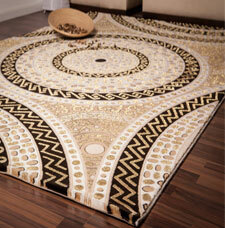 Empera is a range of unique super luxury and heavyweight acrylic rugs. What really sets this range apart is its stunning ultra modern-chic designs, which combine the old and the new in a magnificent and innovative style. The rugs are also super soft to the touch and additionally feature Lurex application, which is a metallic dye that makes some parts of the rug super shiny and glittery. A truly fantastic collection of rugs offered at great value. Fabric: 100% Acrylic with Lurex Application.